Half Orcs are People Too! With this derpy looking drawing, David Sutherland inspired many hours of game play and ideas about half-orcs in AD&D. Today we take a closer look at half-orcs of AD&D, where they come from and how they get used. Often considered rude, crude, obnoxious and brimming with muscle… well, ok, those rumors might be true. Half-orcs are a favorite of gamers looking to hack and slash their way through situations when that thinking stuff gets in the way. The Players Handbook (AD&D 1E Easley cover Pg 17) refers to the monster manual ORC heading for details of the core race. These are the days when orcs resembled pigs in many respects. They had pinkish snouts, piggy ears, and bristles. They are prone to violence and fighting at any moment, and breed with anything (ANYTHING). The Monster Manual suggests or-goblins, orc-hobgoblins, and orc-humans. They cannot interbreed with elves, but one has to wonder what else orcs have bred with! The general race is Lawful Evil, but the player character types are of the upper 10% of those spawned from orc and human mixing. Half-orcs may pose a challenge for some if you stick with racial level limits in the rules as written. They only progress to level 4 as clerics, 10 as fighter, 8 as thief, but are allowed various combinations. One of the more interesting is Assassin(U)/Cleric(4). In these combinations, half-orcs are only restricted by the lesser class when it comes to armor use. The curse of multiclass follows in that, even after attaining level 4 in cleric, the character must split their XP for the rest of their career. Half-orcs, because of their lineage, are assumed crude unlikable bullies. It’s almost true, in that a -2 penalty is imposed on half-orc Charisma, which could only be a maximum of 12. This is in regards to other races however, and 12 isn’t terrible. Most DMs will apply some social stigma for players who bear obvious orc characteristics, and rightly so in many human or partly fey settlements. +1 bonuses to Strength and Constitution is a tempting offer for a fighter. Unlimited in assassin levels may be important IF, as a player, you can contain yourself to operate within a party setting. For the long haul campaign this might be tempting. Infravision to 60′? Yes please. Without that pesky orcish -1 in sunlight. Combination of classes, especially fighter/assassin offers a powerful character. The attack table of a warrior, with the backstab and the 50/50 assassination table rolls makes a deadly creature that also offers interesting role play opportunities. 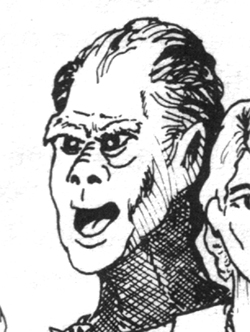 Dave Sutherland made a derpy looking dude peeking out from behind the other races for the PLayers Handbook. A million people laughed at the expression on his face, but we knew the potential that was lay hidden under that drawing! What are some of your favorite Half-Orc Heroes? ← How to screw up Races in AD&D!